If love is patient and patience is being long-suffering and long-tempered, here we might say that love is long-tolerating. In other words, “love is not irritable” (1 Cor. 13:5). We’ve all been there: your waiting in line at Wal-Mart/Super-store and the check out worker is a rookie in training, the person checking out is a little old lady who doesn’t know how to work a debit machine and keeps hitting the wrong button, and then something doesn’t have a price tag on it so you have to wait for a price check and then the rookie check out person makes a mistake and so he/she has to signal the manager for help, and as you look around for another line to jump into there’s only one or two other lines open and they are all filled up with people and not moving much faster and you get totally annoyed with the situation and the people involved. How do you then treat the check out person when you get up there? Because God has been abundantly patient with you in Christ, you show them patience. Love is not irritable. And yet, we so easily get irritated and respond in unloving ways when we are at the grocery store, the airport and our flight is delayed, in dealing with government employees who lost our paperwork, in dealing with our not so tech savvy parents when their Skype keeps crashing on their dinosaur of a computer, at restaurants when our food order gets messed up. And the list could go on and on. This is the stuff of a Seinfeld episode. When we are outside the situation it makes for a good funny story. But when we are in the situation, God calls us to patience. 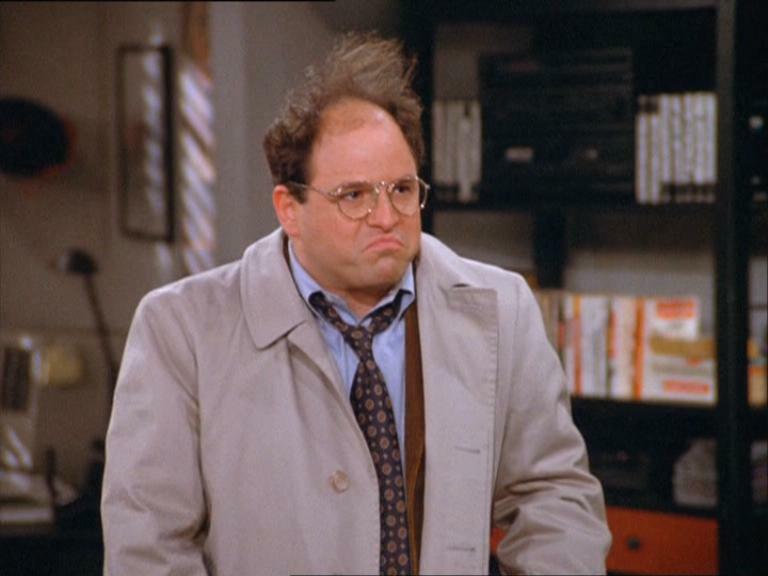 He calls us to love people who annoy us and not to be like George Costanza who gets so easily irritated with others. Love is patient and kind. . .it his not arrogant or rude. It does not insist on its own way; it is not irritable. (1 Cor. 13:4-5). Jesus was not irritable and had every reason to be with his disciples who were so slow to learn. And he has every reason to be irritable with us for being so slow to learn from our foolish and sinful ways. We are to bear with one another in love, and to remember that “love covers a multitude of sins,” and annoyances, we might add (1 Pet. 4:8). And so, as I said last week sometimes we need to overlook an offense, whether someone has sinned against us or simply annoyed us with their personality (Prov. 12:16; 19:11). We are to be patient and bear with one another in love (Eph. 4:1-2). Another thing to remember here is that we should practice the judgment of charity towards others, i.e. not imputing motives to them and interpreting their actions in the worst possible light. In other words, giving them the benefit of the doubt. So for example, if someone offends you because they only stuck around to talk to you for a few minutes after church and then left, a judgment of charity would say, “perhaps they were feeling sick and needed to get home because of what they ate at potluck.” Or if someone doesn’t return your e-mail, instead of saying, “this person is ignoring me,” the judgment of charity says, “perhaps it was sent to their spam junk box.” And we could list many more examples of how to exercise a judgment of charity with others. We should always give people the benefit of the doubt and never assume we know the motives of their heart. And remember, you have made others wait at times. You have habits that annoy other people too (trust me!). And you are still be sanctified yourself and are not yet perfect. These are a few things to remember that will go a long way in cultivating patience with people’s shortcomings, bad habits, and annoying personality traits. And once again, this doesn’t negate correcting another’s faults or confronting someone about an irritating habit or their sins. But whatever is annoying us about a person, we must first confront our wrong attitudes and deal with our own heart and make sure our desire to correct or confront a person is not from a spirit of impatience but from a spirit of love and concern for the welfare of the other person and with a readiness to forgive others as God in Christ forgave us. Only the gospel can ultimately motivate us to be truly patient and forgiving towards others. And so, beloved, you are to be patient with others because God is abundantly patient with you in Christ. So in thankfulness to God, be patient: 1. With People Who Mistreat You, 2. With People Who Provoke You, and 3. With People Who Annoy You. Who is God asking you to be more patient with this week? Is it your husband who is always home late from work, your wife who is constantly nagging you, your teenage or college age son who doesn’t pull his weight around the house, your daughter who complains and is ungrateful, your toddler who breaks things and ignores your instruction, your child who keeps you up at night, other people’s kids, your mom who embarrasses you around your friends, your dad who is inconsistent with rules and lazy, your flaky friend, your co-worker who annoys you or competes against you, your teacher who isn’t fair, your student who is slow to learn or is drama for you, your boss who is overbearing, your government leaders who don’t share your same policies, your church leaders who aren’t running things the way you would, or maybe your pastor who sometimes preaches too long? No doubt we need more of the love of Christ in our life for all the impatience that is still in our hearts. May God help us by His Spirit to grow in patience because He has and continues to be so patient with us in Christ. Amen! This entry was posted in fruit of the Spirit, patience, peacemaking and tagged fruit of the Spirit, patience, peacemaking by Brian Cochran. Bookmark the permalink.